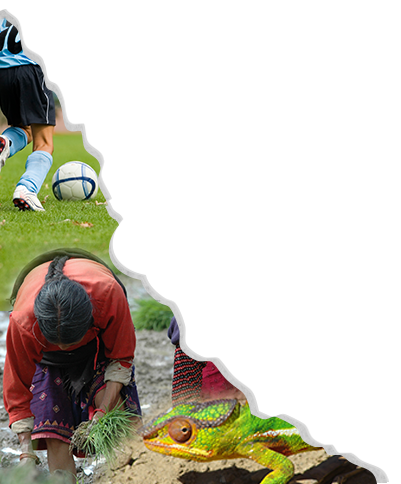 In part one of this two-part series, Krista Harper (UMass Amherst) provides insight into her successful Fall 2014 course, “Anthropology of/through Games.” There is so much here that is useful for instructors (as well as gamers). Enjoy! I teach in rural New England, where we have long winters. When the snow piles up, we stay inside and make our own fun. So perhaps it’s no accident that the top three American board game companies started here, or that there is a flourishing community of independent game designers hidden in the hill towns of western Massachusetts. Growing up in California, I always enjoyed playing games, but when I moved east, games became a part of my winter survival strategy. Society—and social science—is starting to take games seriously. Game designer Eric Zimmerman recently proclaimed the twenty-first century to be the “Ludic Century.” Jane McGonigal argues that “reality is broken” and games may be the solution for social problems. New journals such as Game Studies and Games and Culture have gained footing, and MIT, NYU, and many other universities now offer degree programs in Game Studies and Design. In education, the shift to active classroom pedagogies is renewing interest in games for learning. Can students learn complex anthropological theories through playing, studying, discussing, and designing games? I first developed my idea for a course on “Anthropology of/through Games” when I joined a workshop on “Designing Low-Tech Games for the Classroom” offered by Sam Anderson of the University of Massachusetts Amherst Information Technologies. I was intrigued, but I also worried that teaching through games could lead students into the kinds of reductionistic thinking that anthropologists deplore. Sam presented theories of learning design and walked us through the process of taking a specific teaching goal and working it into a game activity for students to play in the classroom. 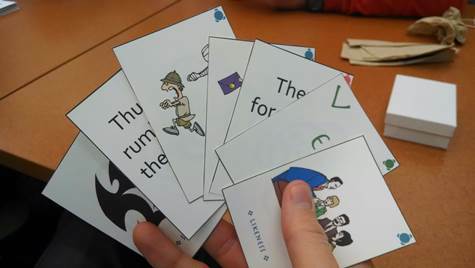 He invited UMass librarian and historian Kate Freedman to present her experiences teaching the Reacting to the Past curriculum in which students play a role-playing game that requires them to use primary documents to inform their game-play. We also heard from game designer Meguey Baker, who shared her work as part of a participatory design team that developed a suite of social justice youth development games in collaboration with the Yegna initiative for girls in Ethiopia. After hearing their stories, I was inspired to bring games into my anthropology teaching, too. I developed a 1-credit experimental course on “Anthropology of/through Games” which was offered in Fall 2014 through Commonwealth Honors College. In my course, we used tabletop, card, and computer games to explore themes in social, behavioral, and cultural theory such as play, gender, language, symbols, economic exchange, and power. As homework, students read texts, played games, and posted questions and comments to our #anthgamef14 Twitter stream. We learned about the basic elements of game design by inviting local game designers as guest speakers. 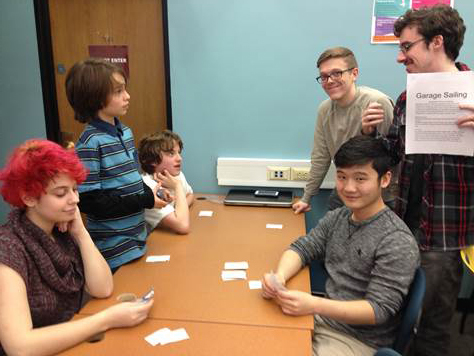 As a culminating project, the ten students were divided into small teams to develop a game based on a social theory to be playtested at our own “AnthroCon” game night at the Du Bois Library. The course material was presented in three major units: 1) “Theorizing Games,” 2) “Ethnography of Games,” and 3) “Cultural Anthropology through Game Design.” I attempted to integrate simple, low-tech games (requiring no more than ink and paper) into each weekly class session, taking up Anastasia Salter’s challenge to design a game a week. In the first part of the class, we read cultural theories of games. Drawing from the work of anthropologist Roger Callois, we attempted to develop a working definition of games that could be applied across different cultural settings. We read Audrey Anable’s feminist analysis of gender and “affective labor” in casual games like Diner Dash, at the same moment when the #Gamergate polemic was raging and media critic Anita Sarkeesian was subjected to violent threats for speaking and writing about the endemic harassment of women in video games. I presented further analytic lenses for game design, referring back to Salen and Zimmerman’s book, The Game Design Reader (2006, MIT). These discussions helped us understand how games work at the micro-level, in terms of narrative and mechanics (what game scholar Ian Bogost calls the “procedural rhetoric of games”), as well as the broader social significance of playing games. Students capped off the unit by writing a critical review of a game of their choice. In the second part of the class, students applied cultural anthropology’s core method, ethnography, to study people playing games. We discussed biocultural approaches to game behavior through Jeff Snodgrass’ research on World of Warcraft players, as well as Adrienne Shaw’s work on gender, race, and sexual identities among gamers. Tom Boellstorff’s essay, “A Ludicrous Discipline?” provided a framework for students to reflect on the relationships between games and “real life.” In their mini-ethnographies, students tackled status symbols among Magic the Gathering card-game players, Pokemon characters as objects of memory and emotional attachment, and social dynamics between players in a massive multiplayer online role-playing game (MMORPG). The last part of the class was an experimental mash-up of anthropological theories and hands-on game design. 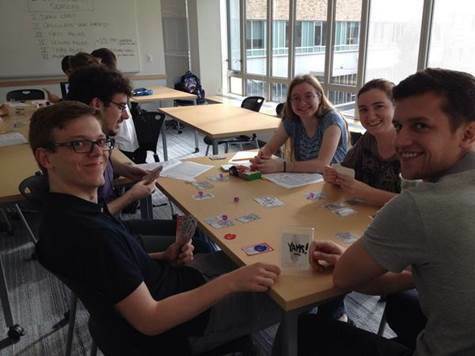 We launched this unit by playing Jesse Harasta’s fabulous economic anthropology game, Yams!, a card game based on Malinowski’s Argonauts of the Western Pacific and Coral Gardens and their Magic. Small teams of students then selected an anthropological article from a list I compiled of “game-ready” texts and developed game concepts linked to the theoretical and ethnographic content. Sam Anderson visited my class for an afternoon of low-tech “gamestorming” when students sketched their basic game ideas using markers, stickers, post-its, and pennies as game tokens. Sam helped students match concepts to potential game mechanics or goals. I invited art professor Copper Giloth to present her tablet game Labyrinth of Fables, in which players navigate a reconstruction of a garden at Versailles that was destroyed over 200 years ago. Giloth used historical documents and archaeological evidence to recreate a maze with riddles based on Aesops’ fables—an example of how digital humanities are intertwining art, literature, computer science, and history in exciting new ways. I also brought in local designer Joshua A.C. Newman to talk about the specific challenges of representing cultural diversity in his anthropological sci-fi role-playing game Human Contact. Newman started developing the game as a critique of Star Trek’s militarized colonial and cultural engagements. In Human Contact, players construct imaginary space cultures, fraught with their own issues and fracture lines, and then have them meet, confront shocks, and try to understand each other. Newman explained how he avoids having predetermined “bad guys” or inherently heroic protagonists who are destined for greatness: “Nobody is good or bad because of inherent attributes…make an interesting problem, and whether you’re looking at abstract or imaginary cultures or real ones from history, make sure they are treated as people.” The student teams workshopped drafts of their game designs with Newman. Instead of a final exam, we held “AnthroGame Con” in the university library during finals week. Library patrons were invited to take a study break by playtesting the teams’ games. One team developed a game about consumption and climate change, inspired by anthropologist Susan Crate’s work. Another team ambitiously tackled one of Thomas Turino’s articles on Peircean semiotics in ethnomusicology—developing a creative Pictionary-like game where players compete to compose short songs on a computer to illustrate a theme (“climbing up a steep hill” or “doing a physics problem set”). In Tyler Caldwell’s and Caleb Miller’s card game Garage Sailing, another team took on Mauss’ theories of gifts and exchange via Gretchen Hermann’s ethnography of garage sales. Each player has a secret identity (“parent,” “nerd,” “antique collector,” “fashionista”) that shapes the value they attribute to other people’s junk as they bargain hunt, haggle, and dump. At AnthroGame Con, players flocked to the game’s kitschy aesthetic and frenzy-inducing “Shiny Objects” cards. 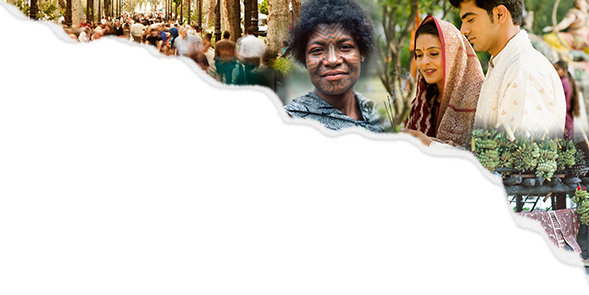 Teaching cultural anthropology of and through games was a transformative experience for me as a social scientist and educator. Before teaching the class, I worried that our focus on games might descend into “edutainment.” Instead, analyzing, playing, and designing games opened up creative ways to do what anthropologists do: to unpack theories, to try on other people’s perspectives, and to understand both stated norms and improvised, embodied practice. In Part 2 of this blog post, I reflect on the pedagogy, current constraints, and possibilities for game-based teaching in the university classroom. Tags #anthgamef14, #gamergate, Adrienne Shaw, Anastasia Salter, AnthroGame Con, anthropology, Audrey Anable, Copper Giloth, Diner Dash, Eric Zimmerman, ethnography, gaming, Higher Education, Human Contact, Ian Bogost, Jane McGonigal, Jeff Snodgrass, Joshua A.C. Newman, Kate Freedman, Krista Harper, Meguey Baker, pedagogy, Roger Callois, Sam Anderson, teaching, Tom Boellstorff, UMass Amherst, World of Warcraft, Yams! I am the Typology Master associated with The Typology of Serious Games and Exercises. I would like to include anthropology teaching games with our other games. Could you please recommend to me a number of “off the shelf” games that others might use?